This volume was the initial publication of the Pension Research Council of the Wharton School, published in 1955. 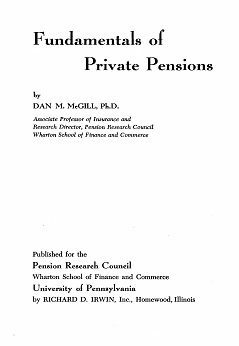 It represents Professor Dan McGill’s first effort to describe the private pension establishment in the United States. He also intended the volume to serve as a basic text for those aspiring to a fuller understanding of private pensions. After reviewing the economic and demographic rationales for the establishment of company pensions, the author described the key features and types of pensions, methods of financing, and approaches to funding. Costs and benefit guarantees were also covered. This was a path-breaking and prescient volume in U.S. pension research and thought.